The National Weather Service is reporting a 30 percent chance of rain on Tuesday, turning to rain and snow, likely, on Wednesday. There are no predictions yet on the amount of snow this storm will bring. If significant snow does fall at the upper elevations, expect the avalanche advisory to be “High”. The high temperatures have produced a hard slick surface for new snow to slide on. Similar conditions existed after last week’s storm dumped 10-14 inches of snow. Two avalanches were reported last week in the Tahoe Basin. One slide occurred near Mount Rose on March 9, 2013. A dry slab of new snow slid on a base of old snow. The slide closed one lane of the Mount Rose Highway. 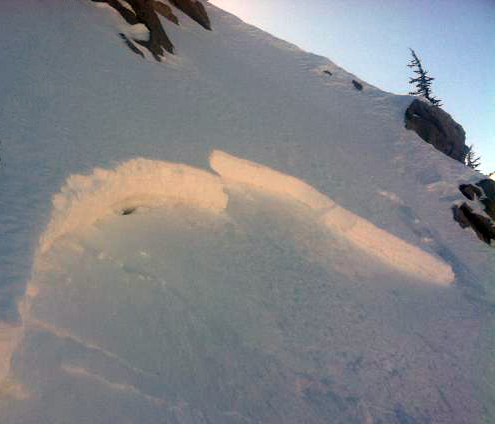 This avalanche was triggered by a snowboarder. No injuries were reported. A second slide was reported in the Donner Summit area on March 7, 2013. This slide was triggered by a skier, sending a 60 foot wide wall of snow 700 feet down the mountain. The skier rode the slide partway down the mountain, before popping out to the side uninjured. Current avalanche conditions are “Moderate”, with human triggered avalanches possible. Sierra Avalanche Center.